The first round of talks ended on Saturday. The main differences are on the pace and timing of sanctions relief for Iran in return for its steps to restrain its nuclear program and on the nature of monitoring mechanism to guarantee Iran’s compliances with the agreement. In essence this is an arms control agreement to ensure Iran would not build nuclear weapons. Western diplomats say talks might go into overtime only for few days after the 30 June deadline; but there will be no extension as in the previous two occasions. Kerry/Fabius meeting ended at 8:15 PM. Iranian delegation left Coburg at 6:20 PM. Kerry-Zarif second meeting ended at 4:13 PM. IAEA DG Amano visited Palais Coburg, the site of negotiations, and left after a short stay. French FM Fabius: At least 3 conditions unmet yet for a deal: snapback mechanism, military inspections, lasting limits on nuclear R&D. Kerry/Zarif meeting ended. It ran from 12:06 to 1:35 PM. French FM Fabius will arrive in Vienna today. Federica Moghirini, the EU foreign policy chief, will arrive in Vienna on Sunday. Kerry told reporters: Some very tough issues, and I think we all look forward to getting down to final efforts here to see whether or not deal is possible. Zarif told reporters: We are determined to do everything we can to be able to make this effort possible. 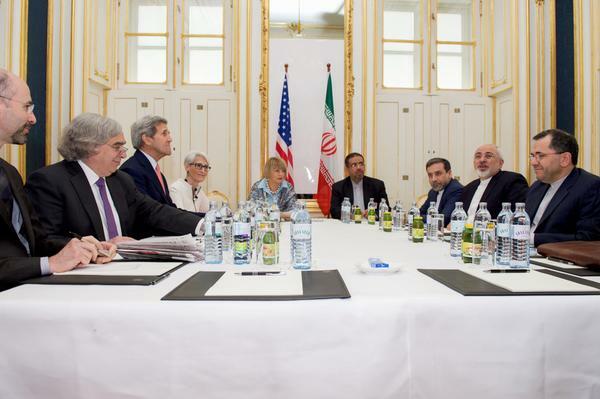 Kerry, Zarif meeting began in Vienna at 12:06 pm local time. U.S. Secretary of Energy Ernest Moniz is attendance.